Although the three guides are interactive, they do stand-alone and may be used individually by those of differing ability and experience of identifying Sphagnum in the field. The “Basics Guide” assumes little or no experience and is very much intended for the novice; the “Intermediate Guide” introduces a number of uncommon taxa and variant forms not covered by the “Basics Guide” and should assist those already able to identify the most common types of Sphagna; while the “Advanced Guide”, is intended for those with a more specialist interest or some degree of expertise, particularly those seeking to identify some of the rarer species and the taxa and forms requiring at least some microscopic study. The structure of the three guides incorporates the key identification features of each taxa, listed chronologically and illustrated where possible by photographs. In the “Advanced Guide” key microscopic features are added and all of the Sphagna are included in their taxonomic order. However, in the “Intermediate Guide” the taxa from the “Basics Guide” are included after the new additions. ​Part 3 features species already covered in greater depth and introduces a number of the less-common species which may be encountered. ​Although Sphagnum mosses are often associated with bogs, a significant number of species occupy quite different habitats and sometimes very particular niches. The nature of these varied environment influences the way these plants grow. The following section introduces the importance of habitat, in particular the way this effects the appearance of Sphagnum and also introduces the characteristics and features which enable their identification in the field. Sphagnum mosses are generally considered tricky to identify, even by trained botanists but, in actual fact, most of the commonest species have quite distinctive and sometimes very diagnostic features which are usually observable in the field. This guide flags up the “special characteristics” of seven of our commonest species; where possible including them in order of importance. If any of these particular features are seen, identification should be confirmed by checking that the colour, size, form and habitat are right. Inevitably, there will be the occasional problem specimen, usually encountered when a species is found in an unusual situation but, most Sphagnum found in their normal habitat should be readily identifiable in the field. There are many good references to Sphagnum identification but, the three noted below are particularly recommended. Some older texts may contain wonderful illustrations but name changes over the years may confuse the beginner. O’Reilly, J., O’Reilly, C. and Tratt, R. (2012) Field Guide to Sphagnum Mosses in Bogs. FSC. Publications, Telford. ISBN 978-1-85153-276-6. Daniels, R. E. and Eddy, A. (1985). Handbook of European Sphagna. Institute of Terrestrial Ecology, Huntingdon. ISBN 0-904282-82-1. For the novice Sphagnum surveyor, the fold out glossy full-colour guide produced by O’Reilly, O’Reilly and Tratt provides a useful field tool. It has good quality photographs and a few basic pointers identifying twelve significant Sphagnum species. 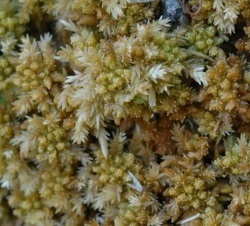 It also shows a selection of other Bryophytes and lichens which might be encountered with Sphagnum and contains some basic ecological information. Atherton, Bosanquet and Lawley is a comprehensive, full-colour guide to the Bryophytes found in the British Isles. It also contains good quality photos and will prove very helpful to anyone traveling more widely in the UK as it shows all of the Sphagnum species known to occur. However, the descriptions are quite brief and generally inadequate for critical determination. Daniels and Eddy is more for the specialist and should be consulted to confirm identification as it contains very good line drawings and descriptions of both the morphological and microscopic characteristics. However the novice will find some useful pointers here, particularly information about habitat.